In a country as rich as ours, it’s hard to believe that people struggle to put food on the table for their families. Statistics show that more than 900,000 New Jersey residents experience food insecurity every single day. The Community Food Bank of New Jersey is the largest anti-hunger organization in the state. They managed to serve over 47 million meals to families all over New Jersey in 2018 alone. To help them with their mission, the Savory Spice Shop in Westfield is hosting a food drive until the end of March. But they need your help to make it a success. 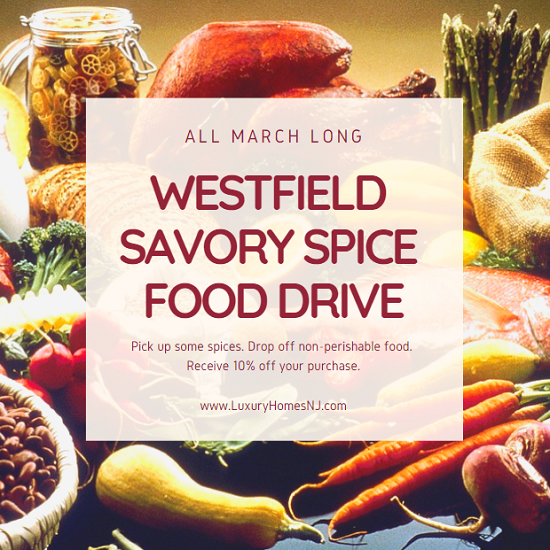 How can you help the Westfield Savory Spice food drive? Stop by the shop located at 138 Broad St. between now and March 31st. Pick up some of their special blends of spices to make your dinner more flavorful. Bring in non-perishable food items (canned food, pasta, pancake mix, peanut butter, dry soup, ground coffee, tea, etc.). In return, the Savory Spice Shop gifts you with a 10% discount on your purchase for the day. You pay less for seasoning your family’s meal while ensuring that other families get to enjoy a meal of their own. Everybody wins! The Savory Spice Shop is open Monday through Saturday, 10 am to 6 pm and Sunday, 11 am to 4 pm. While you’re at the Savory Spice Shop, sign up for one of their amazing classes. The next one, “Spice Your Health With Nutrigenomics”, takes place on March 28th. Author Simone Mitjas teaches you about the natural health benefits of various spices for relieving stress, extending your life, and increasing your overall health. Spaces are limited. So, if you’re interested, you need to contact the shop today at (908) 264-8947. Speaking of charity, don’t forget to visit Jersey Mike’s on Wednesday, March 27th. That’s their annual “Day of Giving” event. Every single penny from the sales they garner that day will be donated directly to local charities, including our own Westfield Area YMCA. If you can’t make it for lunch on Wednesday, you can still stop by any time this month to donate when you pick up one of their tasty sandwiches. Bon appetit!